artwork-dimensions: 21 x 26.5 cm. The first page of a new sketchbook is devoted to a project for a friend, the cover illustration to Joanne Light’s book, Love Poems. This is the first of many collaborations with Joanne. Joanne encouraged Robert to pursue the theme of troubled romance and the complexities of relationships, a significant shift of direction for Robert. 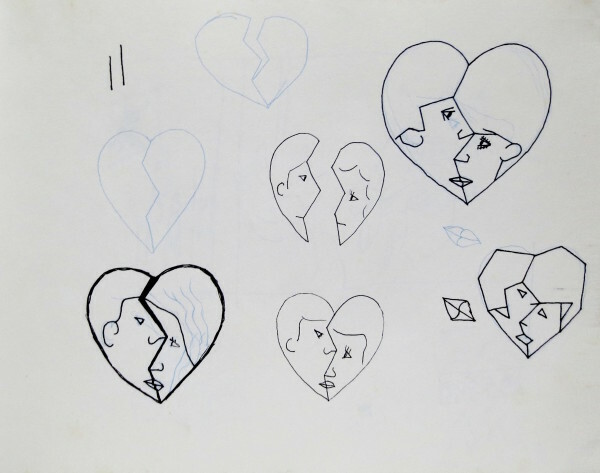 In these studies, Robert starts with a broken heart, then places two heads inside the divided heart. The two Brancusi-like heads come together and kiss as the rounded forms become more angular. In one simplified image, Robert combines notions of love and unity, heartbreak and separation. Copyright © 2019 Robert Pope Archive. Website Design by Wingspan Creative Communications.